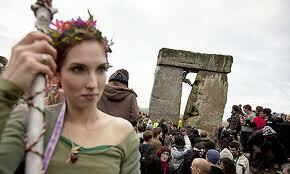 If you're a Druid, or other enlightened pagan, it's the holiest moment of the year. Many, many early cultures began calendar keeping after observing both the summer and the winter solstices. The winter solstice got highjacked centuries ago for Christmas, which is why pagans still hold tight to the summer solstice. At Stonehenge, they'll be having a par-tay. Shakespeare wrote Midsummer Night's Dream to celebrate the appearance of fairies in the woodland landscape on the solstice, when some men can also become asses and everybody falls in and out of love, willy-nilly. Herbs have stronger healing powers on the solstice, and magic spells have greater range and effectiveness. If you love the earth and gardens and the eternal turn of the seasons, you'll know where to be tomorrow night at 1:04 a.m.